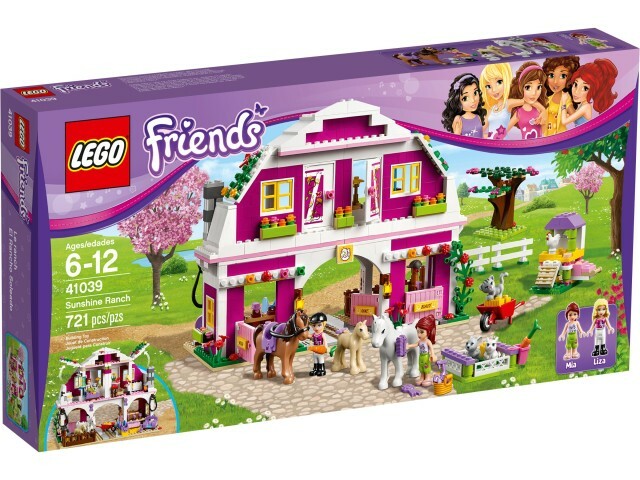 This must not have been a very popular set because Amazon has 41039 Sunshine Ranch discounted by 25%. It is now just $52.84, beating our last mention just after Christmas by a couple of bucks. 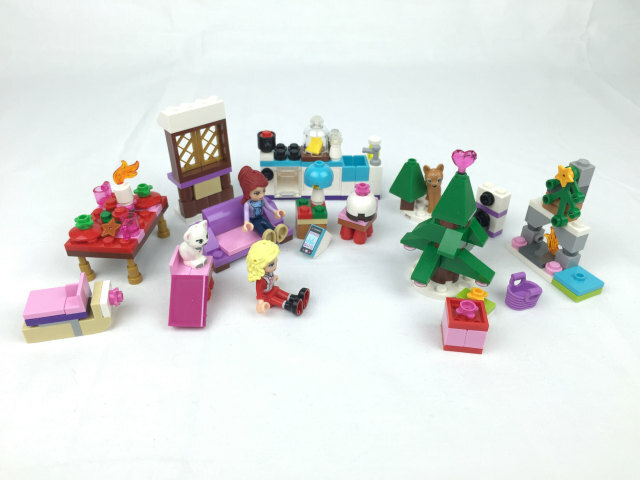 It’s now January 1st, and all of the new 2015 sets are now available to purchase from LEGO Shop@Home. They also have a promotion going on for the month of January. 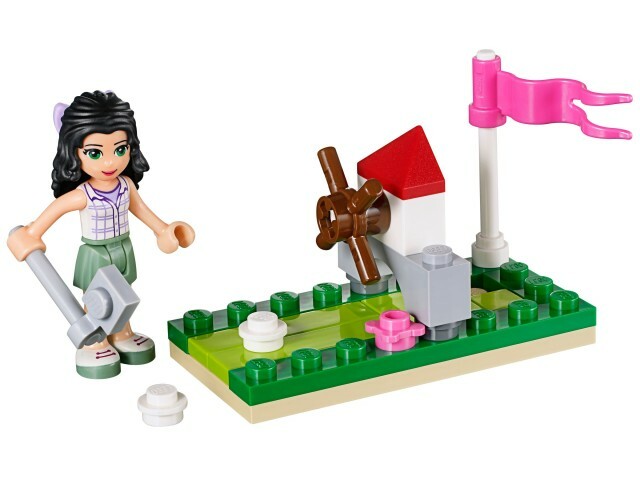 Buy any LEGO Friends set and get a MINI Golf Set for free! 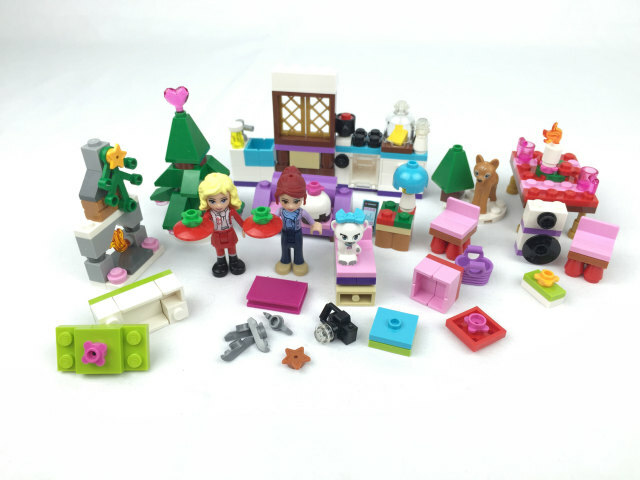 The set comes with Emma. 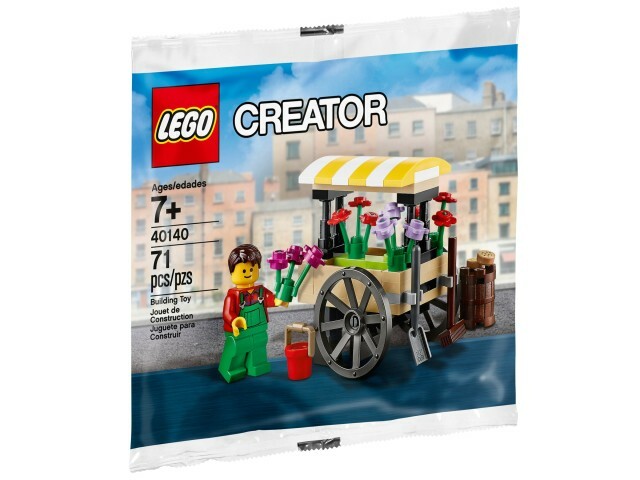 There is no minimum purchase required, but if you order $75 worth of LEGO or more, you’ll not only get free shipping, but a free Flower Cart set as well. Both promotions are good until January 31st, or while supplies last. 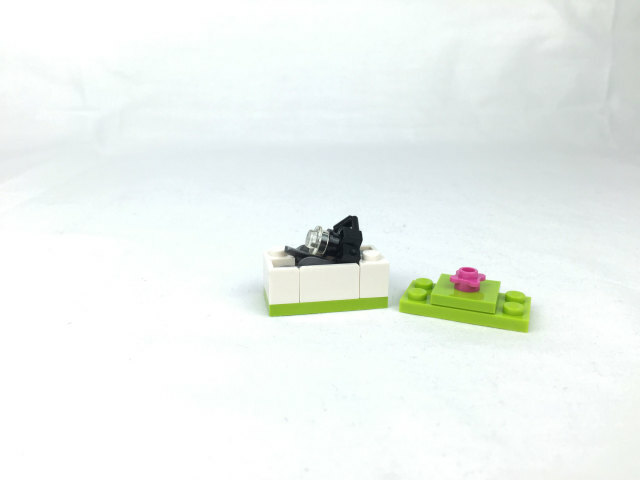 I’ve listed the new Friends sets below with prices. Happy shopping! Right now, Amazon is selling 41039 Sunshine Ranch for just $55.51, a 21% discount from $69.99 MSRP. The set ships for free. Sunshine Ranch includes minidolls of Mia and Liza who is exclusive to this set. So this day, the last day of the advent calendar, annoyed the most out of any advent calendar day I’ve ever built. And here’s why. This is what it looks like. It’s got two pairs of ice skates and a camera inside. 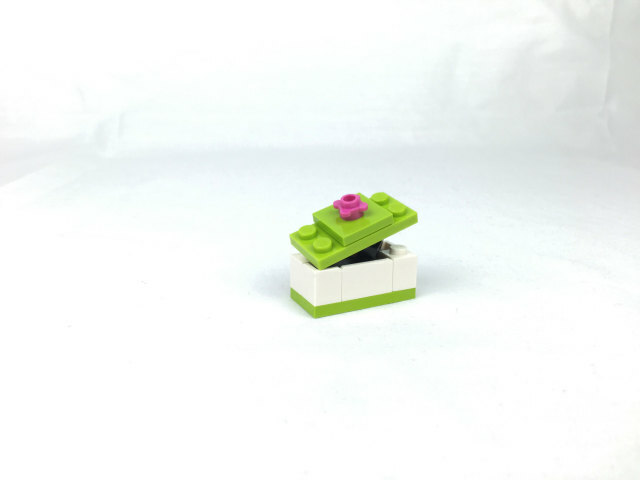 The problem is that there isn’t enough real estate inside the box to keep it all together without sticking out the top, so it’s impossible to keep the lid closed. The two pairs of ice skates can fit inside the box just fine. 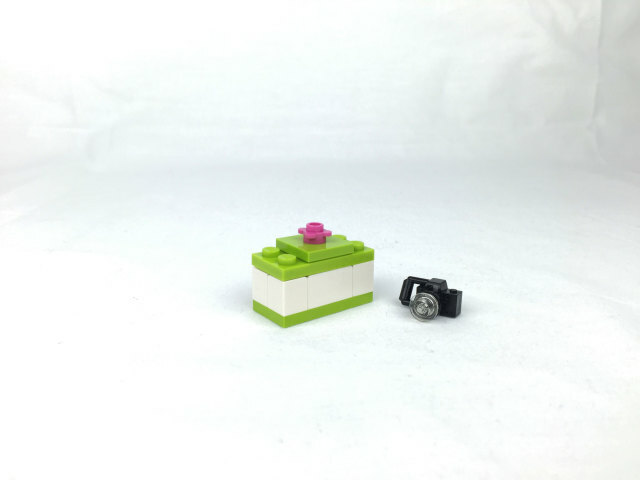 The camera could have been just an extra item that accompanies the gift box. It would have been a nice way to end the calendar, but instead we’re given an impossibly stupid build. Ugh. And that’s that. Another advent calendar in the books. I know I’ve let the site completely lapse since the end of last year’s calendar, but I promise to try and fix that for this upcoming year. 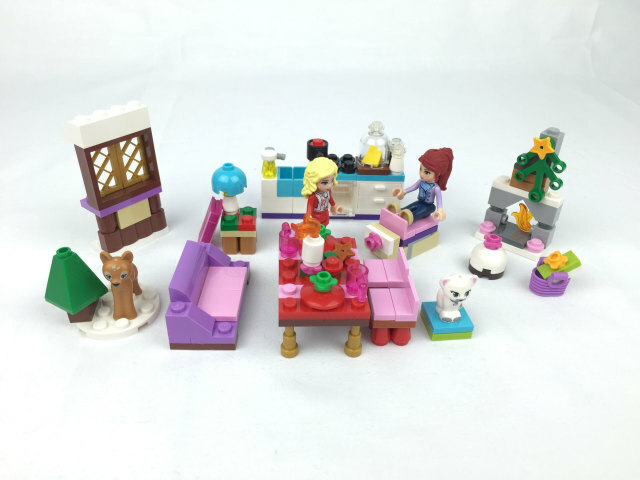 With Disney Princesses getting some new sets and a whole new theme of Elves being made, it’s hard not to get excited. There’s a LOT to look forward to. Finally, a tree. For a second there I thought we may not be getting one. Similar to last year in terms of build, but different enough to be new for everyone. 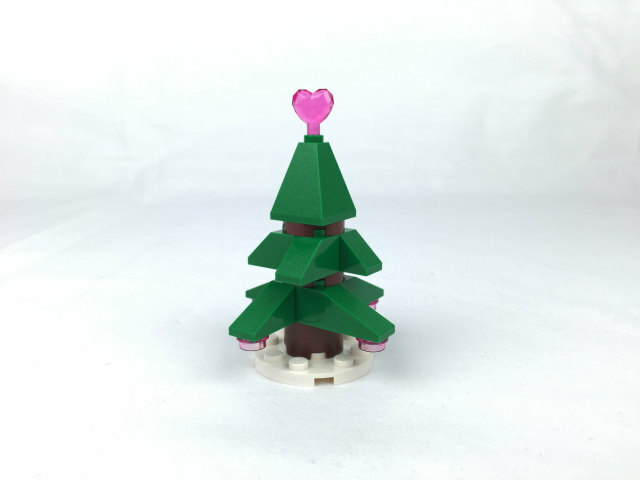 Comes with a pink tree topper that’s, what else, a heart, and a few trans-pink 1×1 round plates for ornaments or lights. 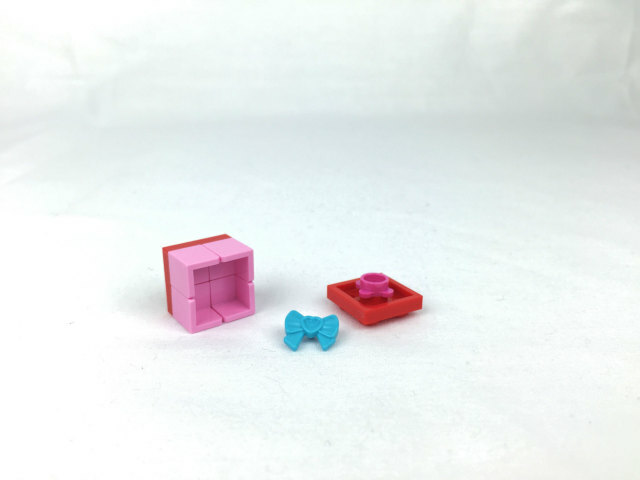 Finally, something to point all of the previous builds at. One more day and we’re done. What can it be? 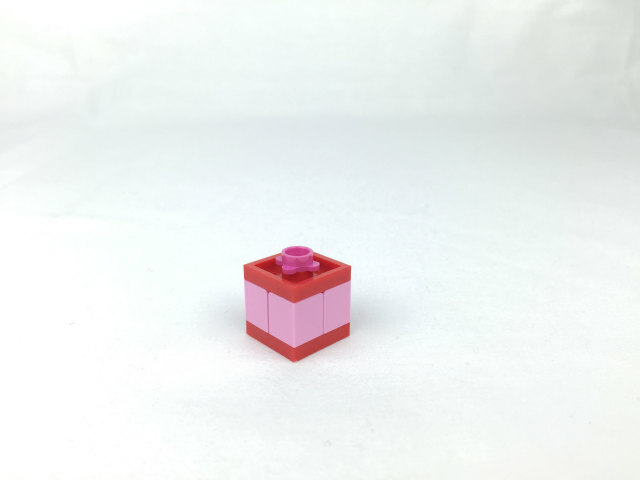 Today’s build is a gift box. And it’s an actual gift box with a gift inside. Last year’s gift boxes were simply a stack of plates and/or bricks so this is a rather nice upgrade. You build the box with a series of panels and then flip the top plate upside down to create the top of the box. It’s not a secure connection by any means as the lid will pop right off if you look at it wrong, but that aside it’s nice to have an actual box. The gift that’s inside is a bow which can adorn either of the girls’ head or even the cat from two days ago. At first I thought it was just an MP3 player, but the phone icon gave it away as a smart phone. And there’s what I can only assume is a Bluetooth portable speaker, ’cause it ain’t no headset that’s for sure. 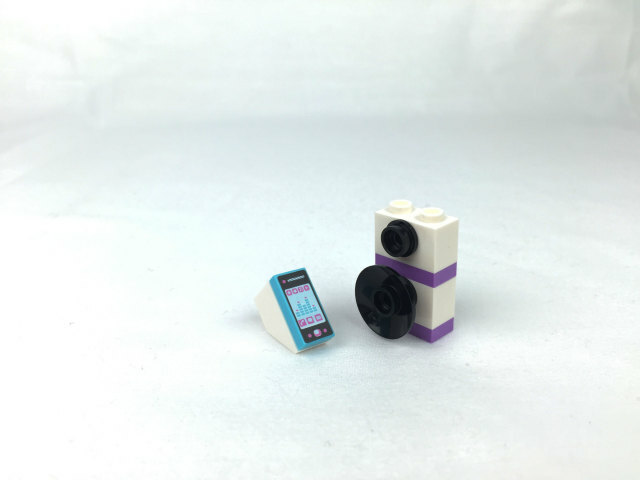 Plus, you’re supposed to mount the phone on an inverse slope brick as a stand. It’s kind of an odd build but I’ll take it. The smartphone print on the 1×2 tile is pretty sweet. If you’re still looking for presents to put under the tree, you probably have a lot going on in your life and you’re so busy that you’re looking for shopping ideas on December 20th. Well, if the person you’re shopping for is a Disney Princess fan, then have no fear. 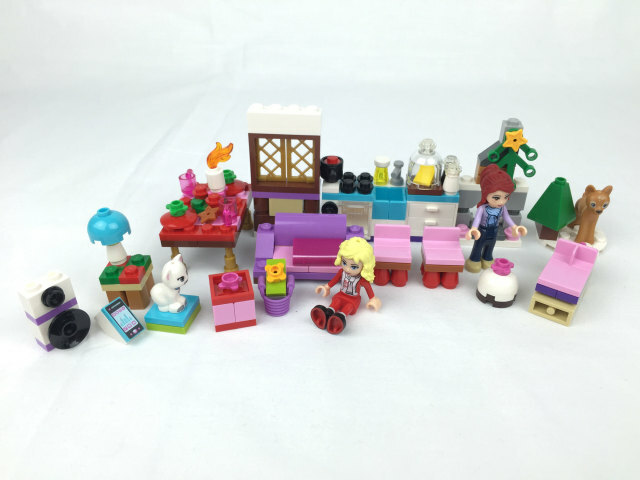 Just head on over to your local Target brick and mortar store and check out the LEGO Friends aisle. 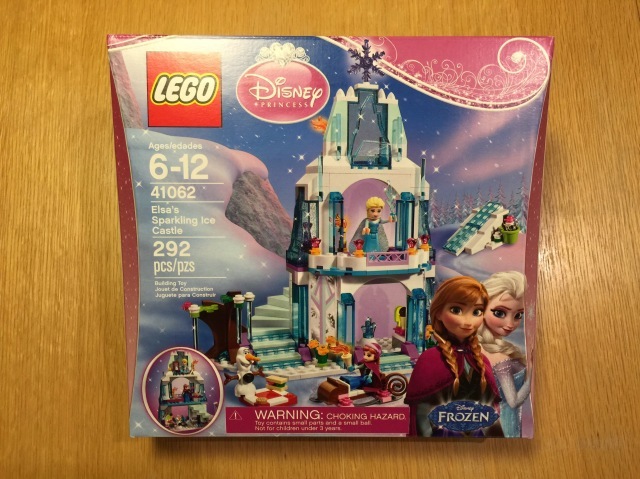 I was there earlier tonight and picked up the Frozen set, 41062 Elsa’s Sparkling Ice Castle. It was $39.99 plus tax. I did not get a picture of the other ones, but they had all of them there: 41063 Ariel’s Undersea Palace, 41061 Jasmine’s Exotic Palace, and 41060 Sleeping Beauty’s Royal Bedroom. 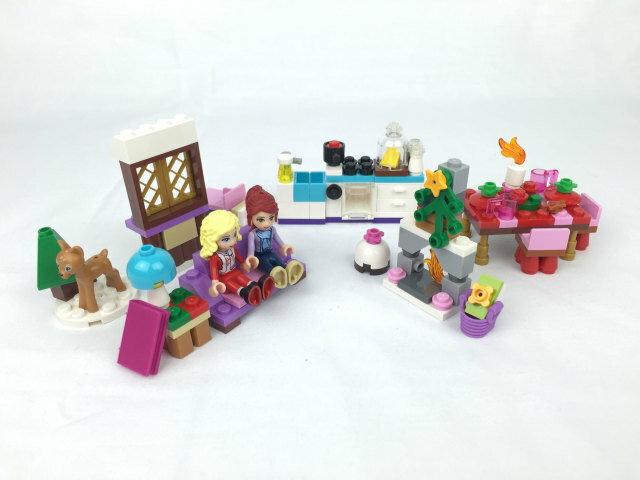 My daughter has no idea they were even making a LEGO Frozen set so this should blow her mind. The only problem is trying to contain my own excitement and not give it to her earlier than Christmas Day. And here it is: the pet. Specifically, a white cat. The print is nice with some touches of grey for detail. 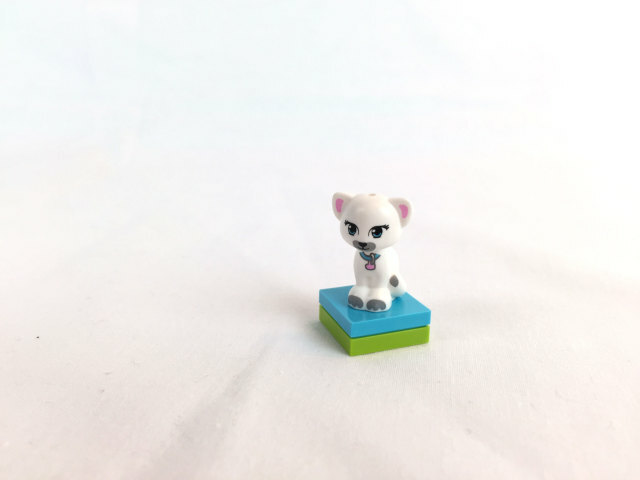 The face, ears, and collar are also printed. I especially like the dab of gray at the tip of the tail. It’s a nice touch. Last year’s pet, and I’m pretty sure with the year before, we would just get the animal piece, and nothing else. This year, I guess too many people complained about getting something you don’t even build so they threw us all a bone and included two plates to slap together so that the cat has something to perch on. Better than nothing I suppose and definitely an improvement from last year. Sofa, Divan, Loveseat, Daybed, whatever you call it, it goes perfectly with yesterday’s end table build. Our interior is almost complete now and with just a few more days left in the calendar, I bet we can get a complete interior by the time this whole thing is over. We’re still missing a tree, so there’s that… and I’m pretty sure we’ve always gotten a pet of some kind, though the fawn from Day 4 may have already covered that. We’ll see. Anyways, cute couch. Now the girls have a thing to sit on in front of the fireplace.